BLACKFIRE BlackICE Hybrid Montan Sealant Wax 3 oz. includes a poly foam wax applicator. If you demand the best performance and stunning looks on your black or dark-colored automobile, this is the wax for you. BLACKFIRE BlackICE Hybrid Montan Sealant Wax doesn't just push the limits of premium wax performance -It explodes through them! BlackICE combines nature's best waxes with Wet Diamond Polymers to impart a wet, deep and highly reflective shine on all paint colors. This fusion of ingredients creates a hard shell of protection that offers outstanding durability, even in the torturous-tropical climate of South Florida. Traditional carnauba car waxes offer great looks, at first. Often their reflective shine will fade faster then the protection they offer. This is because the glossy oils that give the wax its beauty quickly depart. BLACKFIRE BlackICE Hybrid Montan Sealant Wax features premium ivory carnauba wax that is blended with purified montan wax and synthetic polymers, not wetting oils, to create a super-wet shine that lasts. The carnauba wax used in BlackICE is BLACKFIRE's carefully-selected Brazilian T1 grade carnauba that has been refined into a bright white powder known as ivory carnauba. It is the highest grade of carnauba wax that exists. Montan wax has been used in car waxes for centuries. This brittle mineral wax is often dark brown to light yellow in color, while offering several benefits when used to protect paint. This naturally-colored wax increases the reflectivity of the surface while providing high levels of water beading. The montan wax used in BlackICE is carefully purified to remove any impurities without disturbing the color. This gives BlackICE the a unique texture and deep black color, without the use of dyes. These pure ingredients create deep reflections that shimmer under a blanket of clarity. This head-turning shine will continue to draw admiring glances, and uncontrollable stares, long after it has been applied. In order to create a premium paste wax that ignores the limitations of other waxes, BLACKFIRE fortified BlackICE with Wet Diamond Polymers. BLACKFIRE's Wet Diamond Polymers are an unique combination of three synthetic polymers from around the world. Each has been carefully selected to protect paint and create a rich shine. 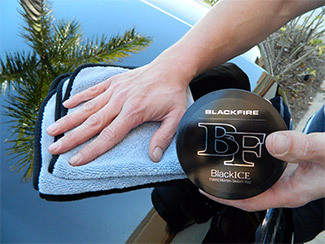 BLACKFIRE BlackICE Hybrid Montan Sealant Wax has been tested to last for 4-to-5 months when driving daily in Florida's tough climate. BlackICE provides outstanding protection against acid rain, bird bombs, bug splatter, and environmental fallout. Excellent water repellency offers outstandingly tight water beads that roll away from the paint. BLACKFIRE BlackICE utilizes the best features of each ingredient, then makes them better through synergistic excellence. After properly cleaning and preparing the paint, BlackICE needs to be applied THIN. Always apply BLACKFIRE BlackICE Hybrid Montan Sealant Wax to clean paint out of direct sunlight. For the best results remove any impurities from the paint, and/or remove any defects with BLACKFIRE Poly Clay or the appropriate BLACKFIRE polish. Apply thinly to all of the automobile's paint by hand or dual-action polisher using a soft applicator pad. Do not apply to plastic trim. Allow to dry to a haze for ten minutes and remove using a soft microfiber towel such as a Supreme 530. This wax was perfect for my new black BMW. Related Items - BLACKFIRE BlackICE Hybrid Montan Sealant Wax 3 oz.